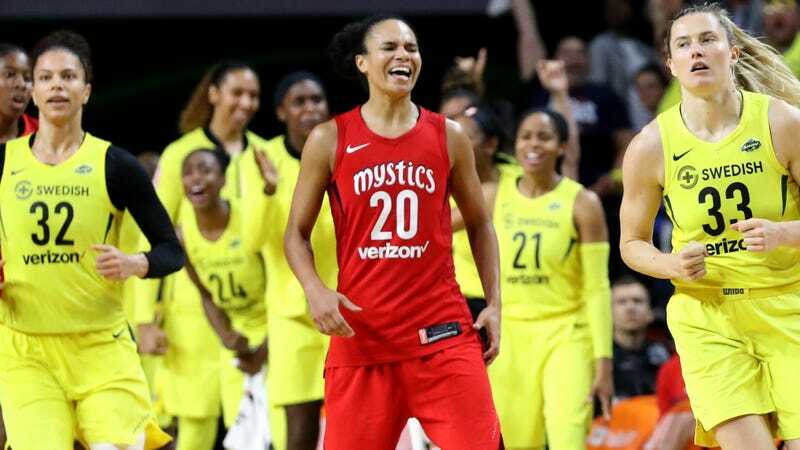 The Washington Wizards announced Tuesday that Washington Mystics guard Kristi Toliver would join the team’s staff as an assistant coach for player development. The Wizards aren’t the first team to hire a woman onto their coaching staff. The Spurs originally made a splash in this area when they hired Becky Hammon as the first woman full-time assistant coach in NBA history. The Kings and Clippers are the other two teams with woman assistants: Sacramento hired Nancy Lieberman and Jenny Boucek, and Los Angeles hired Natalie Nakase. Unlike the other hires, of course, Toliver is still on her current WNBA contract, which goes through 2019. While this position was something she obviously really wanted to do, Toliver is only 31, and it’s worth wondering if this would even be entering her mind if WNBA players got a fairer share of their league’s income. Still, at least she won’t have to worry about one job conflicting with the other—the WNBA season begins in mid-May, and the Wizards’ season will be long over by then.